In the interest of dairy this week, I'm offering two recipes for pasta that use various dairy products. I hope you enjoy! My kids LOVE macaroni and cheese. They request it for birthdays and would probably eat it every day if I would let them. 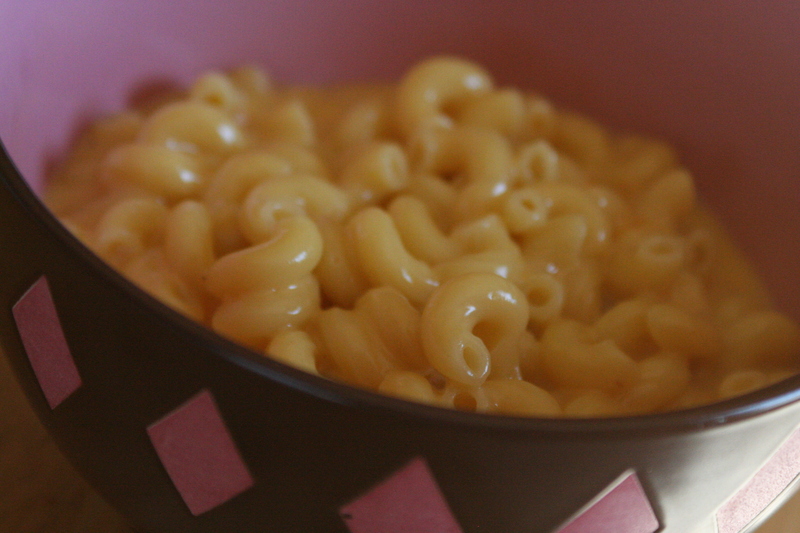 This easy macaroni and cheese is done entirely on the stove. It's makes a great side dish, a simple supper, or a quick lunch. I will say that while it's not my very favorite macaroni and cheese (I'll post that recipe one of these days, I promise! ), it was very creamy, decadent, and good. The boys gave it a thumbs up! Whisk together the eggs, milk, hot sauce, salt, pepper, and mustard. Stir into the pasta and add the cheese. Over low heat, continue to stir for 3 minutes or until creamy (I did it the full 3 minutes since it had the eggs in it). The first time I ever tried pasta carbonara was actually in Kazakhstan. It was very tasty but I have never tried making it. I was pleased at how easy and delicious this recipe is! Bring a large pot of salted water to a boil, add the pasta and cook for 8 to 10 minutes or until al dente. Drain the pasta well, reserving 1 cup of the starchy cooking water to use in the sauce. Meanwhile, heat the olive oil in a deep skillet over medium heat. Add the bacon and saute for about 3 minutes, until the bacon is crisp and the fat is rendered. Toss the garlic into the fat and saute for less than 1 minute to soften. Add the hot, drained spaghetti to the pan and toss for 2 minutes to coat the strands in the bacon fat. Beat the eggs and Parmesan together in a mixing bowl, stirring well to prevent lumps. Remove the pan from the heat and pour the egg/cheese mixture into the pasta, whisking quickly until the eggs thicken, but do not scramble (this is done off the heat to ensure this does not happen.) Thin out the sauce with a bit of the reserved pasta water, until it reaches desired consistency. Season the carbonara with freshly ground black pepper and taste for salt. 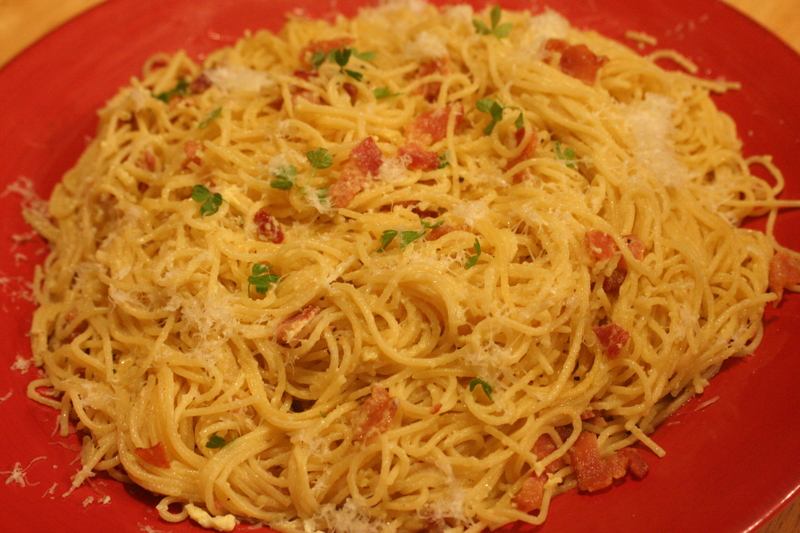 Mound the spaghetti carbonara into warm serving bowls and garnish with chopped parsley. Pass more cheese around the table. Bacon. Bacon makes everything better. Bacon in macaroni and cheese is almost painfully good. And broccoli (peeled, steamed stems) make a good addition too. Alton Brown's recipe rocks, too. It's almost as easy as the "blue box" we don't eat anymore and so much healthier it's not even in the same ball park. I'm going to have to try Alaina's recipe sometime. Trying out macaroni cheese recipes seem to be my niche! The recipe for spaghetti carbonara in Delia Smith's Complete Cookery Course has to be my favourite, unrivaled by any other. But Alaina, your recipe looks quite similar =) It looks and probably tastes delicious!! Thanks for the delicious recipes yet again!! Also I didn't have canned evaporated milk but made a small quantity of my own using a recipe off the Internet (a little cornstarch, a sprinkle of sugar + milk barely simmered together). Could this have been the problem? I have used it frequently in other recipes and they always turn out wonderfully. I haven't given up though. I'm determined to make this again with Gouda cheese. Would that work?